IAEA Director General Yukiya Amano (right) addresses the Preparatory Committee for the 2020 Review Conference of the Parties to the Treaty on the Non-Proliferation of Nuclear Weapons (NPT). The head of the United Nations atomic agency today expressed serious concern about the nuclear program of the Democratic People’s Republic of Korea (DPRK), saying all indications suggest that the country is moving ahead with its nuclear efforts. Speaking the Preparatory Committee for the 2020 Review Conference on the Treaty on the Non-Proliferation of Nuclear Weapons, Yukiya Amano, the Director General of the International Atomic Energy Agency (IAEA), noted that DPRK continues to launch missiles and threaten other countries. “This is extremely worrying,” the Director General told the participants at the session, where he also provided a broader overview of important developments in key areas of the IAEA’s work relevant to the implementation of the Treaty since 2015. “Without direct access to relevant sites and locations, the Agency cannot confirm the operational status of North Korea’s nuclear facilities. But all the indications suggest that North Korea is making progress with its nuclear programme,” said Mr. Amano. DPRK has also withdrawn from the Treaty, known as NPT for short. A landmark international treaty that went into force in 1970, the NPT aims to prevent the spread of nuclear weapons and weapons technology, promote cooperation in the peaceful uses of nuclear energy, and further the goal of achieving nuclear disarmament and general and complete disarmament. In today’s speech, Mr. Amano urged DPRK to cooperate with the IAEA in implementing NPT safeguards, to fully comply with its obligations under relevant UN Security Council resolutions, and resolve any outstanding issues. The Preparatory Committee, which started today, will last through next Friday. It is the first of three planned sessions to be held prior to the 2020 review conference. 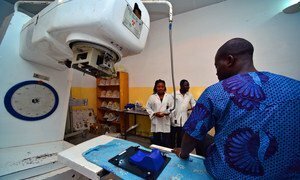 Cancer can be a death warrant in some developing countries, spurring the United Nations atomic agency and the international community today to hold a high-level discussion on how to get more funding and support for treatment to parts of Africa, the Middle East and South Asia.